To be fair, there is little to indicate significant demand for global televeterinary consultation exists. However, in my opinion, the greatest future opportunity for veterinary practice is providing remote consulting directly to animal owners around the world. I have been watching the development of veterinary telecommunications for a long time, and it seems to me progress has been slow. We still don’t have the ubiquitous global broadband web access that was predicted decades ago, although the availability of wireless 5G this year will bring us one step closer. Historically speaking, the veterinary profession has generally progressed along the path set by human medical practice. Human telemedicine already has a strong foothold and is predicted to grow. According to the Mordor Intelligence Report, “The global [human] telemedicine market is anticipated to register (an annual growth rate of) approximately 18.5 percent during the forecast period (2018 to 2023).”1 As people gradually warm to the idea of health teleconsulting for themselves, it is reasonable to imagine these same individuals will look for a similar experience for their pet. One dilemma is that we can’t be certain the global emerging middle class will adopt pets. We also can’t be certain they will adopt bank cards, cell phones, and internet access. There was a time when each of these technologies was uncommon in North America and now all are arguably a middle-class status symbol. Will pets be added to this list? Consider the title of a recent article, “How Pets Became China’s New Status Symbol.”2 It went on to predict China’s pet industry is expected to expand dramatically in the next few years. China is already third in the world in pet-dog ownership after Brazil, another country with a growing middle class. Once they have disposable income, will this developing middle class discover the human-animal bond and obtain pets? I think so. The world goes through economic growth and recession cycles, but the overall trend is up. Countries labeled as “third world” will likely continue to struggle, but “developing” is a status between “third world” and “industrialized.” The prestigious Brookings Institution recently released a report called, “The Unprecedented Expansion of the Global Middle Class.”3 It says the global middle class (i.e. families earning between $10 to $100 per family member, per day) in 2016 was estimated at 3.2 billion people. The predicted increase is 160 million (equal to half the current U.S. population) every year for the next five years. Individual televeterinarians dealing with foreign governments regarding global televeterinary consulting could constitute a dilemma. However, each veterinarian providing global televeterinary practice will likely be licensed and supervised in the country of their residence. Further, if following proposed6 guidelines, the contract to provide service to a lay pet owner will contain a clause that any legal recourse occurs in the country of the televeterinarian’s residence. If the person is providing poor televeterinary advice that detracts from the reputation of televeterinary practice in general, it is important the local licensing board do a review. If the televeterinarian were practicing from a different country, that person would fall under the jurisdiction of their own country’s laws. Existing veterinary licensing boards still might have a dilemma dealing with foreign complaints. However, one stated purpose of every veterinary examining board is to review all complaints. Currently, most U.S. state veterinary medical boards review complaints originating in a different state. The overriding goal is to ensure those licensed by that board are competent. If a veterinarian is providing poor service to clients out of the state or country, it is likely that person is also giving substandard service to the public in general and deserves a review at the very least. An interesting dilemma here is that most current state practice acts require an exam where—at least for pets—the veterinarian must be able to see the patient. With the advent of high-definition mobile phone video, it is now possible to remotely “see” live animals, even allowing the examination to be video recorded. Separate from modifying the definition of “see,” I suspect there will be constituent pressure on elected officials to direct the examining boards to change the law or their interpretation to adapt to the information age. Millennials will likely demand the convenience, while televeterinarians living in the approved states will make so much more money (and pay taxes), the government will be highly motivated to avoid lawsuits and attract a new tax base. All this said, at least one state set a precedent three years ago of prosecuting televeterinarians. As mentioned previously, Dr. Hines was providing televeterinary advice by telephone to people around the globe for a fee. He was cited and fined, and the Texas state veterinary examining board revoked his license. Hines appealed all the way to the 11th circuit court, arguing his right to freedom of speech. The U.S. Supreme Court refused to review his appeal, finding the state’s right to regulate the practice of veterinary medicine trumped his free speech. Many U.S. state boards are now reconsidering their wording, and each is making up their televeterinary rules. This type of patchwork legislation qualifies as a dilemma because it may lead to prosecution of those providing a national or global televeterinary service. In light of the fact human communication and veterinary outcomes have been known to fail, having professional liability insurance protects everyone. If a veterinarian is unfairly targeted by a disgruntled client or by a special interest, insurance can provide legal protection. If the pet owner feels wronged, even if they weren’t, there is money available for a reasonable settlement. To be clear, one-to-one telecommunications is difficult to control, yet everyone wants high standards. Only regulatory agencies (e.g. country or state veterinary examining boards) can control a license, but these boards have limited budgets and volunteer participation. One idea is to create a televeterinary grievance committee and encourage anyone offering televeterinary service to provide this contact information to their clients. If any pet owner felt they had been wronged via televeterinary consulting and did not contact the provider first directly, this proposed entity would investigate. If the practitioner felt he or she was operating in an ethical and professional manner, the client would have an optional step before veterinary board investigation. 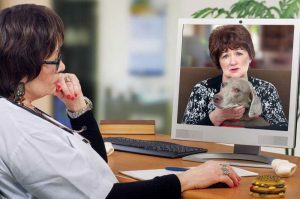 It is easy to imagine that all over the world, there are already millions of pets suffering and living with owners who would readily pay for quality veterinary diagnosis and recommendations if those services were available remotely. The dilemma here is that regulatory veterinary medicine, while genuinely trying to protect the public, may be unfairly limiting the opportunity for the public to access the help they want. Meanwhile, veterinarians are being denied needed income. It is possible conservative state boards will be challenged on the grounds of “restraint of trade” if they are preventing veterinarians from increasing their income by ethically helping people and pets in need, both in American underserved areas and eventually throughout the world. Rolan Tripp, DVM, founder of veterinaryfuturesociety.org, published his first veterinary futurist article, “Veterinary Telecommunications,” in 1984. Dr. Tripp frequently writes and lectures on the future of veterinary medicine. Email him at drrolantripp@gmail.com. On a side note, Tripp is presenting on the topic of televeterinary practice at VMX 2019 in the SVME Ethics Track.